Home / Free shipping is back! Hey so remember when we celebrated our third birthday with free shipping on all products in the U.S. market for three days? Yeah, we think it was pretty awesome too. 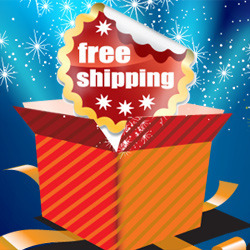 So awesome in fact that we’re bringing free shipping back for the holiday season! Just like for our third birthday shipping, this deal is only available to U.S. customers and will run from Thursday November 15 until 11:59 p.m. November 30. That time is relative to your time zone and not our own Central Standard Time. UPDATE: We’ve extended free for all US customers! Enjoy this opportunity for savings on all QuiBids products, whether they’re bought at the QuiBids Store, purchased through Buy Now, or won at auction! Head here for further reading on QuiBids’ shipping practices. And as always, happy bidding! Free shipping in the US! For good! 3 reasons to start your holiday shopping with QuiBids right now! QuiBids shipping: What you need to know!